Re: Fane 12-250TC Retro Speaker. The on-axis peakiness seems to have been flattened out, so that I don't need the splayed array formation anymore, and have reverted to firing straight down the room. 1. 80L is the point when diminishing returns set in regarding how low you can get them to go whilst keeping a reasonable cabinet size. From 80L upwards, a couple of Hz more low end extension requires a disproportionate increase in the cabinet size. IMO it's not worth going above the 80L benchmark. 2. A single, lateral, holey brace below the driver is sufficient to keep cab vibration under control. 3. No wadding in the interior airspace is either needed or desirable, unless you actually like dull, lifeless, boredom. 4. Back, bottom and sides of the cabinet interior can however be lagged with 2" rockwool, or 1/2" felt, stapled or glued to the walls. It drops the system Q a little bit and deals nicely with the (quite weak) backwave from the driver, removing coloration. 5. They need a good few hundred hours of running in, during which period, the bass extension gets better as the driver suspension loosens up. 6. This 12" Fane, full-range driver may not be the last word in wideband driver technology, indeed it looks, on the surface, to be deceptively simple, but it doesn't half make wonderful music. 7. For best results, make and fit grilles. Congrats they look beautiful, fully retro as you wanted. iI wish I had time to do a semi omni cube version with two drivers for each cab one on the top. Anyway how does the spud amp change things from the NVA clone. I heard at Owston so I have my opinion but I think things have progressed since then on both of them. I must admit the spud amp looks more interesting in pics, the clone is just a boring box. Aye, there has been some progress with the sound of the spud amp. It was oscillating at HF on the left channel; too high to hear but it was affecting the gain on the left. I discovered it with my scope after noticing a negative voltage on the control grid of the pentode section. Another effect was that the top end was curtailed on the offending channel and thus the lateral balance of the recorded space was way down in comparison to the NVA clone. This also resulted in the depth dimension being flattened compared to the NVA. Now that's had a temporary band aid applied, it is a lot better at the top end and the space you expect from a valve amp is back. It is at the bass end where the NVA is clearly superior to the valve amp and is of course where traditionally, good transistor amps usually beat them. The best thing about the speakers themselves, is that they seem to work equally well with low power single ended valve amps and transistor amps. Full range drivers can be finicky about their amplification but these drivers don't seem to care. Being pro, full rangers rather than hi-fi, they'll have been designed using solid state pro amplification requirements. No exotic foo materials or mystical back story; they're just good honest paper coned drivers that happen to sound great in a hi-fi setup. I had no desire for new speakers until i read your description of these. Now im tempted! Aye, you could do a lot worse. And it's positive; the sound is great. This room has not been intact since we bought the house 37 years ago and attacked it with sledgehammers and steel 'I' beams. I'd not realised the effect, that diagonal line behind the left speaker was having on the bass end. Suffice it to say, the result of having proper walls behind both of the cabs has been er....good. Better yet, I tried a cab in mono, across the room corner you can see in the picture and there were no ill effects. The bass pumped up, low down very nicely due to the corner reinforcement. So.... the plan now is to buy another pair of the Fane drivers and build some cabs into the room corners. These will form part of the bottom section of the custom floor to ceiling shelving units I'll be building into each chimney alcove. The free standing cabs will be sold on, as complete speakers, once the room work has been completed. At least that's the plan for now. 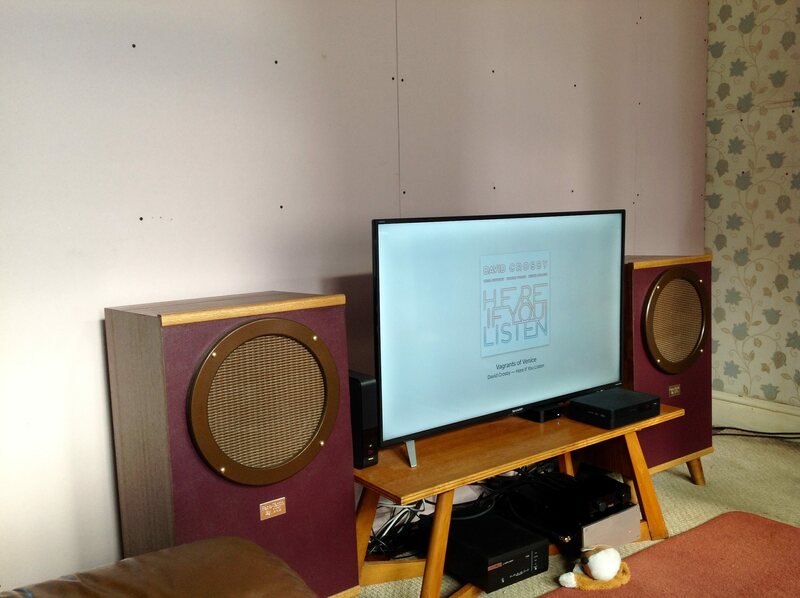 Further improvements in the musical abilities of these speakers came today, with the action of ripping out the remains of the filthy old fitted carpet to reveal again, the dark, stained cork floor I had laid about twenty-five years ago. The floor was in remarkably good condition, having lain undisturbed for a quarter century; still with a nice deep satin sheen, after it had been cleaned. Chucking a nice big rug on it deadened the liveliness of the room a tad, but the room is definitely a lot more "live" than it had been with the carpet down. 1. the increase in the amount of reflected sound coming from the walls, floor and ceiling. 2. the increase in the rigidity of the speaker/floor interface. There are felt pads on the bottoms of the tapered legs, and these and the cork overlay, give enough decoupling from the suspended wooden floor beneath, so that the floor can absorb the reduced vibrations transmitted into it and not sing along. As a result of the above, the music making is live and organic and makes the sound I had before in the much 'deader' space, seem a bit cold and sterile in comparison. That 12" Fane full-ranger is the gift that keeps on giving. Removed the wadding a week ago now and the overall balance has fleshed out nicely. Biggest gripe with full range drivers like these has always been the shriek. Though less afflicted by the dreaded screech than most other FR beasties, there was still a residual of that characteristic, which is arguably unavoidable if you are trying to make a driver that does everything. Now this approach is of course hopelessly unscientific as the cab coloration and internal reflection is unpredictable, meaning that the cabinet system acts more like a musical instrument than a black hole, and it would be nigh on impossible in a production environment to get one cab sounding the same as another notionally identical one. Nevertheless FR cabs sans damping give a speaker system that sounds better than one with even a modicum of wadding inside. I think with these specialist FR drivers we have to think in terms of music, art, rather than science in order to get a good balance out of them in a home environment. I've tried eq'ing the hell out of them with DSP and for me, it robs them of life. It's a testament to how good these drivers sound that it has taken me almost a year to do the final tweak and take out the rockwool. I went through the same thing with back horns years ago, when I lined the back chamber with damping there appeared less detail. When I removed it the music was brighter..
My logic was something was being added with no damping... reflections from the rear was all I could come up with, so my speakers are always well damped . Had a go today with my pair of 10" Faital Pro 10FE200 bass/mid drivers in series with the main full ranger, to get a 16 Ohm load for the OTL. Worked alright. The plan is to put the ten-incher in the base of the speaker cabinet and fire it at the floor. That way I should get some bass reinforcement and if it doesn't work, the mod is easily reversible. Trouble is with 16 Ohms spread over two drivers, the individual driver outputs will drop by 6dB. They will add back together acoustically to regain the same overall system efficiency. BUT.....only with both drivers firing forwards will I get back to where I started. With only measly amplifier power available, I can't afford to lose system efficiency by firing the second driver away from me. I was sorely tempted to put the ten-incher in the top of the cab and fire it at the ceiling. Me and semi-omnis have unfinished business, but with the extra driver on the top of the cab, there is no way to reverse the mod so I'm going to have to resist that particular temptation, even though in terms of keeping system efficiency up, it is a better solution than firing the driver downwards. In the meantime I've reverted the Fanes back to standard 8 Ohm operation with the OTL, while I think things through a bit more.